The other day, I was craving a creamsicle. That orange, creamy flavor got stuck in my head and I just couldn’t get rid of it. But, it’s not quite frozen treat season, so I daydreamed this recipe while riding the subway to satisfy my urge. Oh, the things you can do in a commute. This recipe makes the most of winter’s remaining citrus and involves no refined sugar, but is also a bit complicated and involved. If you don’t feel up for the whole shebang, chose one element to make from scratch (I’d go with the frosting!). You can find a great, store bought cake mix, you can flavor canned frosting, and the tangerine slices can be omitted entirely. Also, if you’re over cupcakes – just bake the batter into a cake. Finally, oranges will work if you can’t find tangerines. 2. Whisk together the butter and agave, then beat in the eggs one at a time. Add the vanilla. 3. In another bowl, combine the dry ingredients, then whisk into the butter mixture. Pour in the milk and stir. 4. Ladle the batter into the cups of a lined muffin tin. Bake for about 18 minutes, til puffed and golden. Remove from oven oven and let cool completely. 1. Using a stand mixer, whip egg whites and agave syrup til egg whites have doubled in size. 2. Add the butter to the egg whites – half a stick or so at a time. Set the mixer to medium high and let whip for several minutes til the frosting comes together (you’ll know when it does, trust me – and don’t be alarmed if it takes longer than expected). 3. When the frosting is done, gently fold in the orange zest, then add the juice a tablespoon at a time, tasting as you go. Note that you may not need all the orange juice to achieve your desired orangey-ness. 1. Using a very sharp knife, cut off the ends of the tangerines, then cut remainder into thin slices. 2. In a large, heavy skillet, bring 1 1/2 cups water and the honey to boil, then add in the tangerine slices. 3. Let mixture boil for 5-10 minutes, turning the slices once. Reduce the heat to medium and let simmer for another 30 minutes, turning slices occasionally. The liquid should thicken to a syrup. 4. When the slices are translucent, remove the pan from heat and let the slices cool in the pan for about 10 minutes, then let cool completely on wax paper. The syrup can be discarded, or saved for another use. 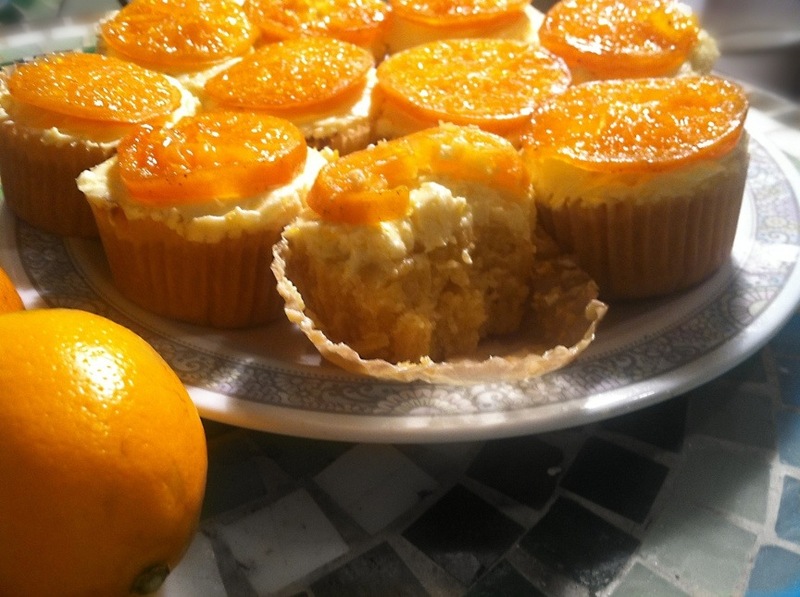 To assemble the cupcakes, slather with buttercream frosting, then top with a tangerine slice.